I have a monkey mind. So do you. It’s part of being human. The monkey mind is ever active, like the proverbial barrel full of……. It throws out distracting thoughts during the day, conjures up dreams each night. He’s a crafty little critter, ever ready to tiptoe in and take over. There you are reading a book, and he pops up with I wonder if there’s enough coffee for tomorrow morning. Or maybe you’re meditating or praying in church. Now what did Tizzy mean when she said that, yesterday? Then there are the times you’re watching a TV program and totally miss the best part because Monkey Mind was deciding – Should I wear the black shoes or the grey ones tomorrow? I don’t know about your monkey mind but mine is ubiquitous and hyperactive. He loves crouching behind my monitor at work, or peeking out from between the pages of my newspaper. My usual response is Now what was I doing? or Where was I? Since he always is asking questions I’ve named my monkey mind George. I practice meditation and yoga to gain a modicum of control over George, and it does help, but there are times I have to smile. He can be cute, especially when he comes up with the darndest questions. Since he’s been a good boy, I’ve promised him he could have his own say in this post. But I’ve limited him to five questions. So without further ado, I present to you the curious questions of George, my monkey mind. When did melted cheese sandwiches become grilled cheese sandwiches? Why do people grunt mmm hmm instead of saying “You’re welcome” when you hold the door for them? Why did everyone switch their cellphone ringtones from songs to actual ringing so that now everyone has to check their phones to see if it’s their phone that’s ringing? Why do we say sick to my stomach but not sick to my throat or sick to my allergies? And my favorite ………. (drum roll please)…………. If Mitt Romney were to win the election would he replace Medicare with Mitticare? I’m sure your monkey mind can come up with some doozies. Won’t you please share them in the comments section? Writing to you is like setting a bottle afloat in the ocean since I have no idea who you are, where you are, or even if you are still alive. But if I could, I’d like to ask a few questions on this, the fifth anniversary of bringing Marcos into my life. I say when he used to walk me because suddenly last April, he woke up one morning and decided I’m old. No more walking. He’s a sneaky critter, that Marcos, making like he’s sniffing the most interesting patch of pavement but what he’s really doing is turning around degree by degree, and before I know it, I’m heading one way and he’s going the other. And when that doesn’t work, there’s this act he puts on. People we pass in the park say “Poor old guy, he can hardly walk.” But poor old guy knows the half way point on our circular route, and once we’re heading back in the direction of the car, he’s prancing more sprightly than any dog this side of the Westminster Kennel Show judging ring. This, from the tireless dog who regularly walked me an hour and a half each morning and an hour each evening. In those days, I was known as that lady you see walking her dog all over the place. And he’s put on a few pounds which brings me to my third question. I hope you don’t find me rude for asking but What happened? Were you too old to take care of him, too sick, too down on your luck. The Good Samaritan neighbor who relinquished him just said you were no longer able to care for him. At 46 lbs when I brought him home, one of my neighbors thought I’d adopted a grey hound. But them I’m also known at the veterinarian’s as the woman who overfeeds every pet she gets. Marcos best friend and roommate, Marceau bears witness to this. and closed the gate behind me. I barely made it into the living room when he took the gate in one bounding leap and was in the dining room. He would have had Marceau in his mouth had I not got there in time. And up to the loft for Marceau who voluntarily exiled himself, for most of the next year whenever Marcos was free and about. But one day, they just clicked and have been best buddies ever since with Marceau shadowing his every move. And lastly, How did you train him so well. I never could have done it. I did try to train my first cat, O.B. Brat, many moons ago. Our training sessions went something like this. So you can imagine how impressed I was with Marcos’ manners- responding to SIT in an instant, sinking to DOWN with but a point of my hand. He doesn’t respond as well anymore. I thought it was because I stopped practicing commands with him but friends have pointed out that he may be going deaf since he never runs to greet them when they arrive anymore. But I am most impressed by, to put it politely, his house hygiene. One of my reasons for not sharing my life with a dog had been the fact that I work all day, and didn’t think any dog could hold his business from 8:00 until after 6. So, I was prepared for accidents at first – but not one puddle in nearly five years. And there were a few times when, due to unavoidable circumstances, I was gone for eleven hours, and still came home to bone dry floors. lately, I’ve had to put down papers. They think it’s their very own slip and slide. And so, upon closing, I leave you with a couple of photos of Marcos as he is today. As well as a bed on a bed. Lights, cameras, action. Welcome to my blogumentary. I will be your narrator and my monkey mind will talk to herself (as usual). I‘m in Manhattan, and as is my usual habit when there, I’m strolling through the Union Square Greenmarket. Farmer’s markets are not cheap, but my bargain antenna is up. If any are here, I’ll find them (or go home empty-handed). Wow! that’s a huge bunch. Okay Sunday dinner decided – Mexican. I have a few enchiladas and sour cream left over from last week. And I have black beans I can soak overnight. I only cook on Sunday evenings, and I only make things I love since I make enough for the week. Luckily I do love enchiladas so I choose the biggest bunch, and look for someone to pay when…..
Wow – that’s bargain! So tiny and cute, and they’re sweet. Good for lots o’salads, and I can use some in the enchiladas. All the baskets have the same amount, but I pick out one with the flattest onions. I once heard on TV that the flatter they are, the sweeter. $3.00 a basket Various hot peppers. Wonder what they are, exactly. Doesn’t matter, nothing’s too hot for me. I cut up one of the cibolla onions and the monkey mind thinks it’s pretty small so I cut up another one and toss it into the pot with some olive oil. I mince a clove of garlic but the monkey mind thinks it doesn’t seem to go far amidst the onions so I mince another one and toss it in. Now for the peppers. Hmm, what kind? I wonder, is this a Scotch Bonnet? I slit it down the middle and use the paring knife to carefully scrape out all the seeds onto the cutting board. I’m careful not to touch any of them. Seeds are the hottest part. Professional cooks usually wear gloves because once the oil get on your skin it stays there. You don’t want to touch your eyes after handling a hot pepper (trust me). But since I’m only using one pepper, I forego caution. And this is the last decision I make with a right mind. Or maybe I should say, a cool mind? Ooh, my fingers are burning. I never noticed those dry cracks in my skin. I must have touched the pepper. Tissues, tissues. I need a tissue! I run through the house to the bedroom and grab a tissue, then another… and another. On my way back to the kitchen I notice the cat brothers who were keeping me company in the kitchen have deserted the ship for the couch, and as I enter the kitchen I see why. It’s like walking into sulfur and brimstone. This can’t be good for me. Think what eating this is going to do to my insides. Maybe I should just throw it away. Nah, come on! Just dilute it with cool stuff. I put stirring as long as I can, then choose my longest wooden spoon and with a stiff, outstretched arm, stir from a distance. Ok time for the beans. Shoot, that’s not enough. I should have cooked more. I stir the mixture and hazard a taste – three beans. Oh my God, oh my God – my tongue, my mouth, my throat. It’s travelling down my chest. Everything’s on fire. This is serious – scary serious! I open the refrigerator in search of cool stuff to add. I almost forgot about the cilantro; good thing I bought such a large bunch. Nice cool cilantro Yuck, it’s sandy. I wash and start to chop. This calls for quantity. Little bits won’t do. Throw it all in! Going heavy on the cilantro does improve things. I can now stir and look into the pot without my face breaking out in a hot sweat. The only problem is ……now, it looks like a pot of ugly soup greens. Ooh ooh, no – my tongue, mouth. It’s just delaying the heat a bit . But, ok, not quite as hot. Of all the times to have selected this flavor! Sigh – why do I always go for the hot? Okay lay out tortilla, slather on some sour cream, – nice cool sour cream; and chunks of avocado, nice cool avocado, and a handful of cheese, Okay, (sigh) time for the bean mixture, just a little. I start nibbling from the end with small bites, and it’s bearably hot, but it’s mostly tortilla. It gets a bit more fiery as I approach the guts and grits of the middle where the cheese and sour cream ooze out along with the stringy cilantro and beans. Still hot but ……….yep, this is doable. Tonight we’ll see the first of the Obama-Romney debates. As expected the media has their shorts in a knot trying to come up with every bit of minutia out there: practice debates and who will play whom; where the wives are, how they feel; pitfalls to which each candidate is prone; pundits pondering “just how important” this debate will be; and of course memorable moments from past debates. Of course no one mentions my memorable presidential debate moment. But that’s because I’ve only revealed it to a chosen few. Also because until recently, I forgot it ever happened. But happen it did. To be precise it was a pre-presidential debate occurrence – literally. 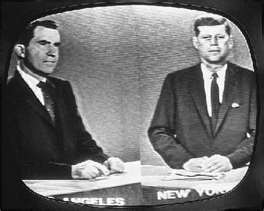 Although it means pinpointing my place in time, it happened just before the very first debate, as in Kennedy/Nixon 1960. I was a high school freshman. My high school was on Lexington Avenue on the Upper East Side of Manhattan. My bus home ran along Fifth Avenue, a three block walk to the west. I was strolling with friends en route to said bus, crossing Park Avenue. 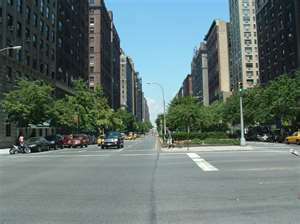 For non – New Yorkers, Park Avenue is a wide boulevard consisting of three lanes northbound, three lanes southbound and a wide shrub-filled median dividing the two. As we were about midway across the first three lanes, the northbound ones, a cavalcade of police cars and motorcycles, sirens blaring, lights flashing, was approaching, preceding a limo in the southbound lanes. My friends chose to hightail it all the way across the avenue. Although I was to grow into an avid long distance racer, at this time, I saw little point to running, and avoided it whenever I could. And with the wide median sitting right there, I chose to wait it out. UN and Fidel Castro had chosen to stay at the Hotel Theresa in Harlem, bringing in live chickens for who knew what purpose. Get the picture? Then you’ll realize why I took the police cars and sirens for granted, all part of growing up in NY. Do you think they believed me? Of course not. That evening I realized he’d been on his way to that first debate, the one where Nixon sweated and grew a five o’clock shadow right before our eyes and Kennedy shined brightly. 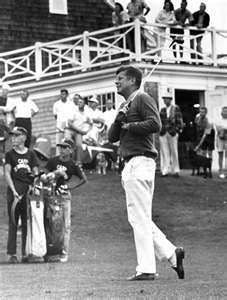 At the time, my family used to spend summers on Cape Cod and we’d make sure we were nowhere near Hyannis Port when President Kennedy was there. It was a given that crowds would clog the streets, waiting for a glimpse and a wave. Ha I’d think. I already got my wave, and I didn’t have to go out of my way. History would soon bring the president to Dallas, and it was never lost on me that Kennedy’s last moments were spent waving from a limousine. So what deep point am I making? I haven’t a clue! So I’ll end by saying may the best speaker speak his peace tonight. And I’ll be here in New York if either one wants to stop by and wave.